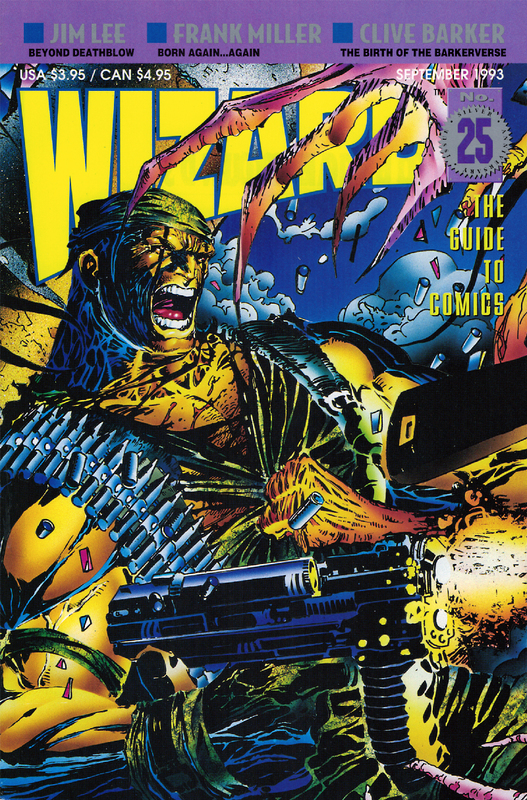 “Palmer’s Picks” from Wizard #25 was a bit of an experiment: instead of focusing on a single creator or even a group of cartoonists centered around a loose theme, I decided to profile a single company and its entire line of comics. And with my usual wonderful sense of timing, I chose Tragedy Strikes Press, an outfit that went out of business right as this issue was going to press. 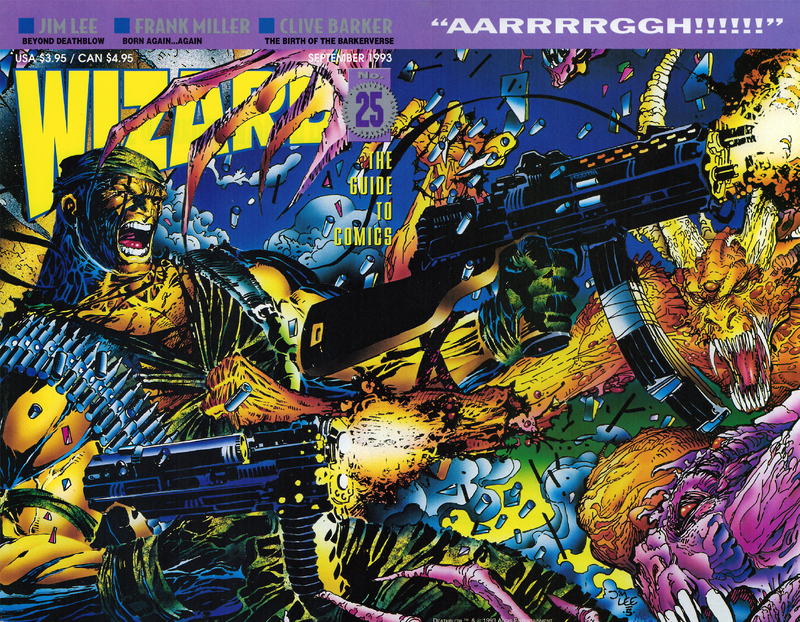 This gatefold cover by Jim Lee for Wizard #25 pretty much encapsulates all of ’90s comics: generic character design, big giant guns, and a lot of yelling for absolutely no reason. I had actually given the small Canadian publisher a short write-up back in “Picks” for issue #20 after receiving a nice letter and care package of comics from art director and cartoonist Nick Craine. Information moved slowly back in the pre-email days, so practically all of my research and preparation for “Palmer’s Picks” was done through the mail. And even more time was added to the process since I had to wait for Wizard to forward me any mail addressed to the column. In hindsight, it might have been easier to set up a post office box, but I was also shuttling between home and college several times a year. If something was sent to a box at college while on summer break, I’d have to wait until I returned to school to retrieve it. 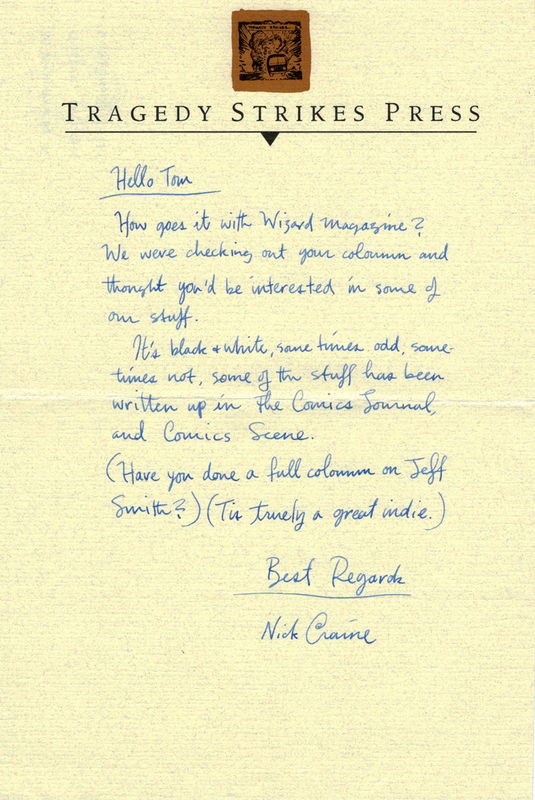 Nick Craine’s handwritten note that accompanied his package of Tragedy Strikes comics. All of these delays meant that I was basically in the dark while putting this “Palmer’s Picks” together. I was happily typing away while Tragedy Strikes was folding up shop. But it really didn’t matter because the comics they made were all really good—You can’t go wrong publishing a cartoonist as talented as Carol Swain. Jay Stephens‘ work might have been a little rough around the edges at this early point in his career, but his unhinged creativity made up for any shortcomings. And giving Dylan Horrocks his first full-length comic was the important first step that led to his landmark Hicksville graphic novel. 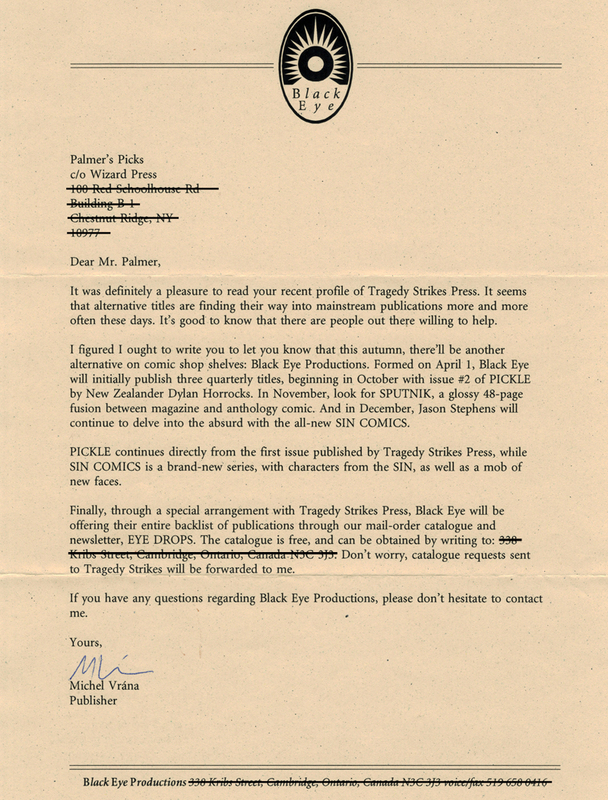 Letter from publisher Michel Vrana announcing the launch of Black Eye Productions. But even though Tragedy Strikes went away, the cartoonists they published all found homes elsewhere. Carol Swain moved her Way Out Strips to Fantagraphics, and both Stephens and Horrocks were there to help launch Black Eye Productions, the new company from former Tragedy Strikes editor Michel Vrana. Black Eye quickly gathered together an impressive roster of cartoonists including Jason Lutes (Berlin), Tom Hart (The Sands), and Brian Biggs (Dear Julia). Wizard sprang for some fancy silver ink to highlight it’s anniversary 25th issue, but the scan presented here doesn’t do it justice. The thing that really set Black Eye apart was the crisp look of its line of comics. Vrana is a skilled designer, and his expertise really showed with all visual aspects of the company, from the classy logo and clean trade dress for each comic, right down to the impeccably designed newsletters and catalogs. The company even had an early presence on the Web, with a nicely laid out website that even contained some early online comics by James Kochalka, Jay Stephens, and Dylan Horrocks. Black Eye eventually folded in 1998, but Vrana currently enjoys a successful career as a book designer. 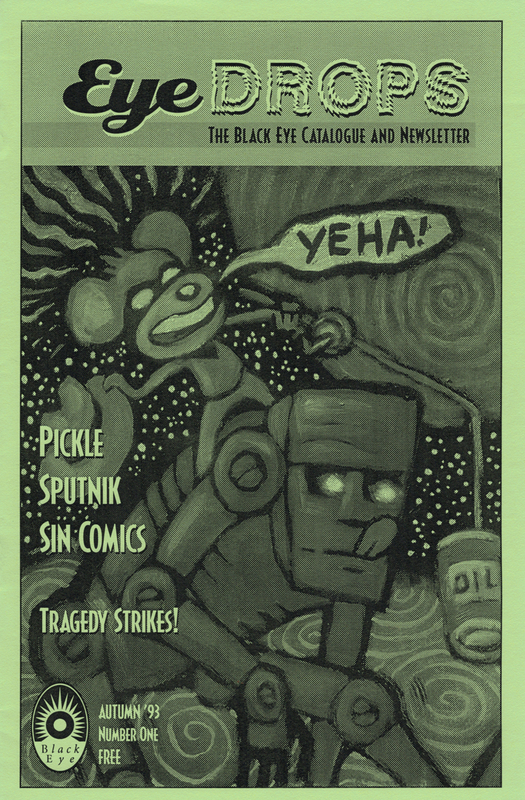 Cover of the first (and possibly only) issue of Eye Drops, the newsletter/catalog for Black Eye Productions, with art by Jay Stephens. 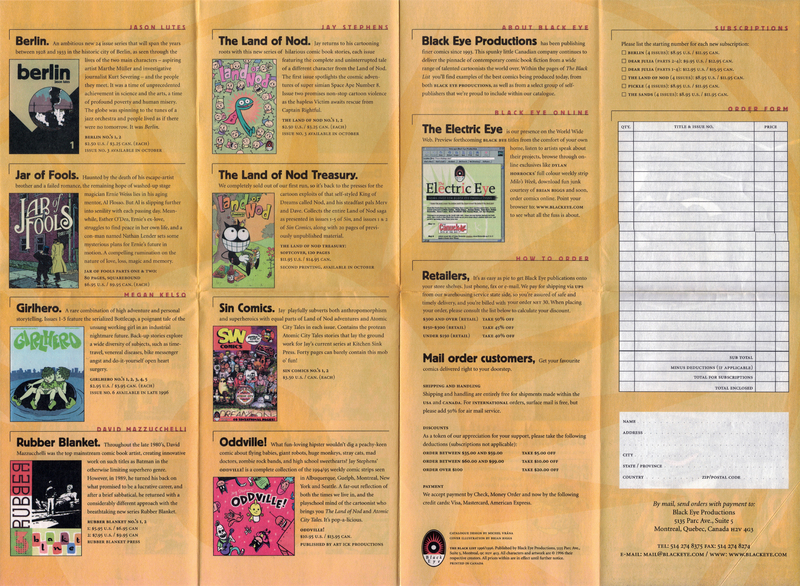 Black Eye’s catalog for 1996-97 was a snazzy full-color fold-out. 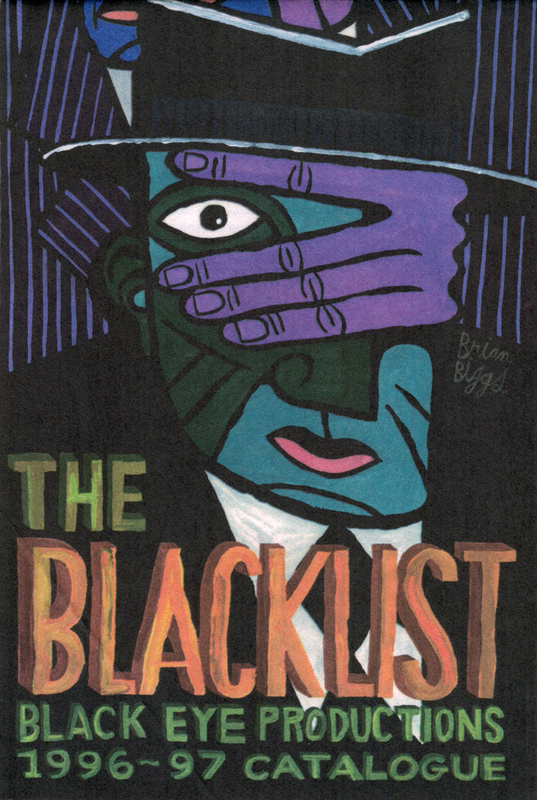 The front cover was a compact 4 x 6 inches with this illustration from Brian Biggs. 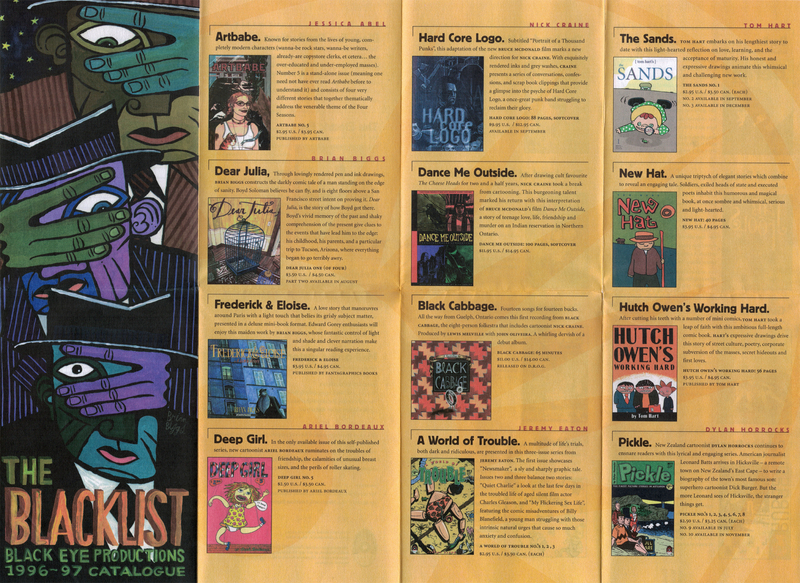 Black Eye’s 1996-97 catalog was folded like a map and opened into this full-size (11 1/2 x 16 inches) image with a nice, clean presentation of Black Eye’s lineup and a few other books they sold through their mail order business. The back of Black Eye’s 1996-97 catalog. Note the faint enlargement of the Black Eye logo in the background and the entry for the company’s website, The Electric Eye. One of the more popular methods for a struggling cartoonist to get his comics into public view is to publish his work as mini-comics, an eight-page comic “booklet” formed by folding an 8 1/2″ X 11″ Xerox copy into quarters. Mini-comics appeal to new artists because they are easy to produce, are relatively cheap (the only production costs are for the actual Xerox copies), and are usually distributed through the mail. Many of today’s big names in independent comics got their start in the “small press,” such as Yummy Fur creator Chester Brown, and Dirty Plotte‘s Julie Doucet. There are also some mini-comic artists who have made quite a name for themselves without moving on to normal-sized comics, like Matt Feazell with Cynicalman and Antisocialman, and John MacLeod with Dishman. Several comic companies publish work from mini-comic artists, but there are very few whose majority of titles are rooted in the small press. One independent company that is an exception to this rule is Canada’s Tragedy Strikes Press. All of the comics it publishes have some connection to mini-comics, either through artists that got their start in minis or by actual series that have been reformatted as regular-sized comics. Tragedy Strikes publishes an anthology title, Reactor Girl, that represents work from both its regular stable of cartoonists, and an eclectic sampling of artists from around the world. Reactor Girl originally began as a three-issue mini-comic anthology in late 1990, until it was picked up by Tragedy Strikes. Unlike other anthologies, it shies away from printing continuing stories, instead focusing more on self-contained short stories from artists both familiar and unfamiliar to comics. Reactor Girl editor Michel Vrana encourages contributors to experiment with new storytelling techniques. The stories range from the expressionistic (sometimes cubist) work of Dominic Bugatto, to the mixed media collages of Linda Carson. Art Director Nick Craine is the creator of what can probably be called Tragedy Strikes’ flagship title, The Cheese Heads, despite many aspects that would apparently make it an unappealing comic. It is the one Tragedy Strikes comic that is not directly related to mini-comics (although it has featured a guest appearance from Dishman), and it is the company’s most distinctive and recognizable title. The Cheese Heads is a bizarre, surreal road trip featuring three nameless characters who literally have cheese for brains! Despite these unconventional qualities that would seemingly detract from the comic’s appealability, The Cheese Heads is one of Tragedy Strikes’ more accessible books. The story basically involves the three Cheese Heads and their quest for identity. Along the way, they encounter a truly twisted cast of characters, including a Mafia widow with a nuclear detonator implanted in her leg, a six-inch tall man who looks like “Barney Miller” star Hal Linden, and Dishman. Craine’s clean-line style is reminiscent of such artists as Dan Clowes and Michael Allred, which also adds to the appeal of The Cheese Heads. An even stranger offering from Tragedy Strikes is Jason Stephens’ Sin, a stream of consciousness comic that encompasses everything from funny animals to superheroes, including semi-autobiographical stories and fake ads. Sin is a truly bizarre comic, as it ties together several seemingly unrelated characters taken from Stephens’ mini-comic work into a cohesive “universe” that somehow makes sense. Stephens’ artwork appears crude on the surface, but he is able to pull off several visual tricks that include a “Back Cover of Death” (with the skeletons of the characters featured on the front cover) and “The Screwy Page” (a page separating the two sides of a flip book comic that can be read from four different angles). Since Tragedy Strikes Press is a relatively new company, its titles are not readily available in most comic stores. You can fix this by asking your local comic store to order them. That way you’ll be able to get your hands on some excellent comics, and help out a new publisher in the process. Coming up: In the next few months, I’m going to cover some of the newer self-publishers out there, but you’ll have to wait until next month to find out exactly who they are. As always, if you have any comments or questions send them out to Palmer’s Picks, C/O Wizard Press, 100 Red Schoolhouse Rd., Bldg. B-1, Chestnut Ridge, NY 10977. I’d like to do a full column on mini-comics in the near future, so I’m especially interested in hearing from those who either do their own minis, or have some addresses of their favorite mini-comic artists. Tom Palmer, Jr. is a freelance writer based in New Jersey. All of the Tragedy Strikes Press titles should be found in comic shops. If you can’t find them locally, you can write to Tragedy Strikes at 30 Wyndham St., Guelph, Ontario,Canada N1H 4E5. Ask for a copy of Paper Cuts, its free newsletter and mail order catalog. All of its comics are black and white with color covers, except for a full color, 24-page sampler that includes comics from all of the Tragedy Strikes books. It is packaged in a CD jewel case. Pickle – Dylan Horrocks’ work has appeared previously in Eddie Campbell’s Dead Muse, and the Australian anthology Fox Comics. He has produced several mini-comics, and Pickle is his first attempt at a full-length, full-size comic. The first issue has already appeared, and the second is on its way. Sin – The mini-comic work of Jason Stephens is pretty rare, but you can pick up his comic, Sin, instead. Four issues have been published so far, with an authentic adhesive bandage covering a gaping wound on the body of Nod on the cover of the first issue (wow! Cool!). Reactor Girl – Three mini-comic issues of Reactor Girl were published before it was picked up by Tragedy Strikes. Six issues of the “large size” have appeared so far, featuring work from a variety of artists from several different countries. Way Out Strips – Like the majority of Tragedy Strikes’ comics, Carol Swain’s Way Out Strips started as a self-published mini-comic. Some are still available, so look in an issue of Way Out Strips for ordering info. Three issues of Tragedy Strikes’ version of Swain’s comics have been published so far. Her work has also appeared in a variety of places, most notably in the original Atomeka edition of the British anthology A1. The Cheese Heads – Five issues of Nick Craine’s comic have appeared so far, including a revised second printing of the first issue. This edition includes a new cover and two-page forward by Craine, a back cover by Mike Allred, and pin-ups by Stephens and John Macleod. The fifth issue featured a guest appearance by Dishman, illustrated by Macleod.